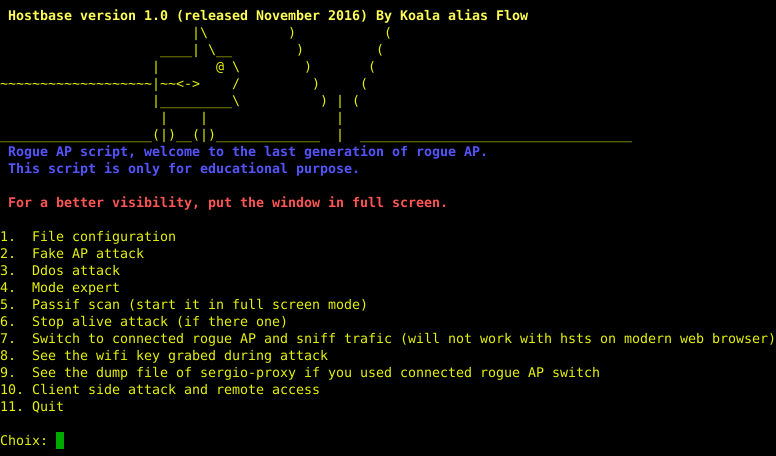 Browse: Home / hostbase – A bash script for advanced rogue AP attack. – update of 11 august 2017: Added tracked channel. 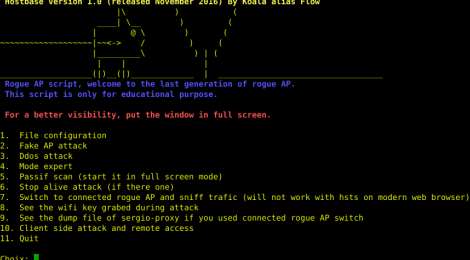 Hostbase is A bash script for advanced rogue AP attack. + Included hostapd multi AP option, that allow you to create multi fake AP (WARNING: to use this attack, CONFIGURE_DYNAMIC_WLAN must be compiled with hostapd install), if you only use the reposity version and not the latest version of hostapd you will have to change your MAC adress before use the multi AP option, please take note of that and see the manual. Included redirect option if you want to use your computer as an evil AP and a dd-wrt router as a repeater with a configured chilispot inside. ← yersinia is a framework for performing layer 2 attacks.